Spanning more than 135 Ma during the 'Age of Dinosaurs', plesiosaur marine reptiles represent one of longest-lived radiations of aquatic tetrapods and certainly the most diverse one. 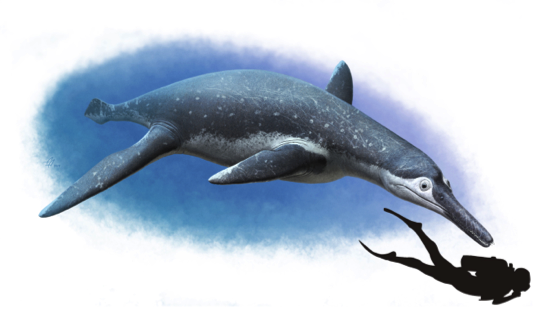 Plesiosaurs possess an unusual body shape not seen in other marine vertebrates with four large flippers, a stiff trunk, and a highly varying neck length. Pliosaurs are a special kind of plesiosaur that are characterized by a large, 2m long skull, enormous teeth and extremely powerful jaws, making them the top predators of oceans during the 'Age of Dinosaurs'. In a new study to be published today in the journal Current Biology, the team reports a new, exceptionally well-preserved and highly unusual pliosaur from the Cretaceous of Russia (about 130 million years ago). It has been found in Autumn 2002 on right bank of the Volga River, close to the city of Ulyanovsk, by Gleb N. Uspensky (Ulyanovsk State University), one of the co-authors of the paper. The skull of the new species, dubbed "Luskhan itilensis", meaning the Master Spirit from the Volga river, is 1.5m in length, indicating a large animal. But its rostrum is extremely slender, resembling that of fish-eating aquatic animals such as gharials or some species of river dolphins. "This is the most striking feature, as it suggests that pliosaurs colonized a much wider range of ecological niches than previously assumed" said Valentin Fischer, lecturer at the Université de Liège (Belgium) and lead author of the study. By analysing two new and comprehensive datasets that describe the anatomy and ecomorphology of plesiosaurs with cutting edge techniques, the team revealed that several evolutionary convergences (a biological phenomenon where distantly related species evolve and resemble one another because they occupy similar roles, for example similar feeding strategies and prey types in an ecosystem) took place during the evolution of plesiosaurs, notably after an important extinction event at the end of the Jurassic (145 million years ago). The new findings have also ramifications in the final extinction of pliosaurs, which took place several tens of million years before that of all dinosaurs (except some bird lineages). Indeed, the new results suggest that pliosaurs were able to bounce back after the latest Jurassic extinction, but then faced another extinction that would - this time - wipe them off the depths of ancient oceans, forever.